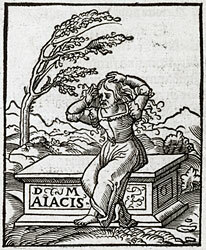 Alciato at Glasgow: Emblem: In Victoriam dolo partam. Victoire acquise par fraulde. On victory won by guile. Heu misera albentes dilacerata comas. Vincerer, & caussa stet potiore dolus. I, Virtue, bedew with tears the tomb of Ajax, tearing, alas, in my grief my whitening hairs. This was all it needed - that I should be worsted with a Greek as judge, and that guile should appear to have the better cause. Et a maintz droictz anichile. 1. The Greek assembly awarded the arms of the dead Achilles to the cunning and eloquent Ulysses, not the brave and straight-forward Ajax. For Ajax’ subsequent suicide, [FALa038]. 2. See Anthologia graeca 7.145.